Jamestown Archives - Joelle Delbourgo Associates, Inc.
MAROONED: Jamestown, Shipwreck, and a New History of America’s Origin, Joseph Kelly, Ph.D.
For readers of Nathaniel Philbrick’s Mayflower, a groundbreaking history that makes the case for replacing Plymouth Rock with Jamestown as America’s founding myth. We all know the great American origin story. It begins with an exodus. Fleeing religious persecution, the hardworking, pious Pilgrims thrived in the wilds of New England, where they built their fabled city on a hill. Legend goes that the colony in Jamestown was a false start, offering a cautionary tale. Lazy louts hunted gold till they starved, and the shiftless settlers had to be rescued by English food and the hard discipline of martial law. Neither story is true. 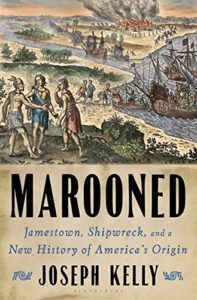 In Marooned, Joseph Kelly reexamines the history of Jamestown and comes to a radically different and decidedly American interpretation of these first Virginians. In this gripping account of shipwrecks and mutiny in America’s earliest settlements, Kelly argues that the colonists at Jamestown were literally and figuratively marooned, cut loose from civilization, and cast into the wilderness. The British caste system meant little on this frontier: those who wanted to survive had to learn to work and fight and intermingle with the nearby native populations. Ten years before the Mayflower Compact and decades before Hobbes and Locke, they invented the idea of government by the people. 150 years before Jefferson, they discovered the truth that all men were equal. The epic origin of America was not an exodus and a fledgling theocracy. It is a tale of shipwrecked castaways of all classes marooned in the wilderness fending for themselves in any way they could–a story that illuminates who we are today.